Pat left school at 15 to start work as a bricklayer. By the age of 17 he had 20 people working for him in the construction industry. Pat achieved his objective of becoming a millionaire in his early twenty's turning over in the region of 70 million in today's value as a property developer as well as being involved in other businesses. When Pat lost his focus, he lost everything and went broke. With the lowering of self-esteem, his confidence shattered and the pressures of a failed business he was forced to refocus to save his sanity, his business and his family. With a new set of goals to achieve, Pat re-focused his energy. His used these new goals to pull himself from the depths of depression. To rebuild his business, his self-esteem and his confidence to go on to achieve what others said was impossible. At the age of 29 Pat took up hill-walking to ease the tensions and help de-stress. On his second day on the hills in Ireland while climbing Corrán Tuathail, Ireland's highest mountain, Pat turned to his walking colleague, Val Dean and professed with excitement that he was going to climb Mt Everest. Of course Val thought he was mad. His new goal became a turning point that sowed the seeds for a life of adventure. Just six years later at the age of 35 Pat had stood on the highest point on our planet, Mount Everest on the 27 May 1995. As well as climbing Everest he rebuilt his business, set up a bank andthen retired from the corporate world at the age of 40 to follow his current career as a team trainer, adventurer and motivational speaker. Through sheer determination, positive attitude, self-belief and new found passion for life, Pat conquered the fear of failure and achieved his dreams. Pat has over 58 high altitude ascents around the world to his credit. Earning him the achievement of being the first Irish man to ascend the highest peak on each of the seven continents, joining an elite group of only 38 adventurers globally to achieve this at the time, Mt Everest being one of these summits. He has also became one of very few people in the world to have climbed Mt. Everest from both sides. From Tibet on the 27th of May 1995 and Nepal on the 18th May 2004. On his travels Pat has lived with over 20 different tribes of people worldwide. From western man just like you and I to nomadic tribes in Africa, to the stone age tribes in the jungles of west Papua New Guinea. He has taken an interest in their customs, traditions and cultures as well as studied their religions and belief systems. Pat has learnt from his experiences as a businessman, adventurer and explorer what is that has driven man since the evolution of our planet,to set out to achieve, challenge and succeed. Whether it is to become a first, plant a flag, conquer a peak, win a match or to succeed in nomatter what it is that we set out to do. Pat believes that we all have an Everest and that we all want to be part of a winning team. Pat has developed a process that has enabled him to make his life one to be enjoyed. Through his training programs, he has developed a formula to encourage others to live life to their full potential. Pat lives at his Mountain Lodge, a holistic and mountaineering training centre at the foot of the MaGillycuddy Reeks, home to Ireland's highest mountain. The Lodge is situated overlooking the Lakes of Killarney and offers a peace and tranquillity rarely found these days. Pat's offices at the Mountain Lodge overlooks Mount Brandon, the ideal surrounding for researching his next expedition or dreaming up the content of the next lecture or course. "I was so proud to be an Irishman to stand on top of the world. For a short time in the history of our planet I had the privilege, not once but twice, to stand on that patch of ground five and a half miles high in the sky at which jet liners cruise. A place that was pushed from the bottom of our seas to the top of the world. The power, the energy and the feeling was amazing"
Never one to rest on his laurels and always having goals, Pat is presently working on three new books, A new documentary on climbing Mt. Everest, a six part TV series on Beyond Endurance, three major expeditions, as well as developing and expanding further his business in corporate and personal development business. The Psychology of Success, A book that shows the formula for success in people lives. "We all have an Everest no matter who we are and we all have the ability to make ita reality". To be completed in May 2005. A follow up to the best selling Freddy T. Bear Dairy that was written by Pat Falvey and Clare O'Leary. Frederick T. Bear,the adventure bear, is an innovative approach to teaching children (and adults) the geography of the world. Through the adventures and discoveries of the bear, as relayed in his journal, e-mails,photographs and video coverage, children learn about the cultures and traditions of the countries which he visits. Second edition due for publication in September 2005. 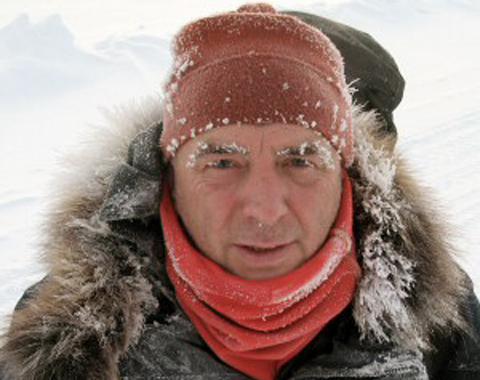 The Three Poles Expedition.A follow on to his book 'Reach for the Sky'. An adventurous,motivational story about following a dream and making it a reality.Ordinary people trying to achieve extraordinary feats. Tying in expeditions to the jungles of the world in search of the stone age tribes, Operation Everest Expeditions 2003 and 2004, Beyond Endurance -across the Antarctic and Operation North Pole. Publication targeted date - January 2007. Presently under negotiation, a TV series about ordinary people setting themselves a target that most would say was impossible. The program follows their journey as they prepare, train, and endure some of the harshest conditions know to man. 2010 : attempt to trek from Ward Hunt to North Pole with two companions had to be aborted after 5 days on the ice. Beyond Endurance - A journey across the Antarctic in honour of Ireland's unsung heroes. To the North Pole - To complete the Three Pole project. North Pole, South Pole and the third Pole - Everest.